Don’t you think we’ve lost the capacity for critical thinking? For losing our discretion when it comes to making decisions… blindly following the strict rules and regulations? Take for example, the simple yet controversial use of travel mugs. Controversial? Yes, controversial. Allow me to explain. Travel mugs are meant to lower your ecological footprint, making the use of paper cups obsolete… well that is the theory isn’t it. Well, I’ll have you know that I cannot finish the entire contents of my mug IF filled to the brim. So, I always ask for them, the wonderful people behind the counter, to only pour the equivalent of a small in my mug. However, I find myself figuratively scratching my head when they proceed to fill a paper cup first before pouring it into my mug. Heaven forbid they give me a drop too much or a drop too little. Kinda defeats the purpose of using one now doesn’t it. I’m happy to say that this doesn’t happen all the time as now I’m accustom to telling them to fill it half way instead. Right, back to being a little bit more serious about critical thinking. It is really easy to take everything that bombards us on a daily basis at face value, not digging deeper into the context. Now I’m not going to lie, it’s an arduous task to sift through all the media broadcasts, but is it worth it when the credibility (or lack there of) behind the messages is uncovered? It’s just like thinking about the purpose of that travel mug before filling it with whatever beverage that the customer wants. It’s about using your judgment in estimating that small-sized amount and then asking the customer if that’s enough. It’s about using your intelligence, taking a step back, and processing our intricate world. Now I could be wrong, so what do you think? Is critical thinking on the decline? 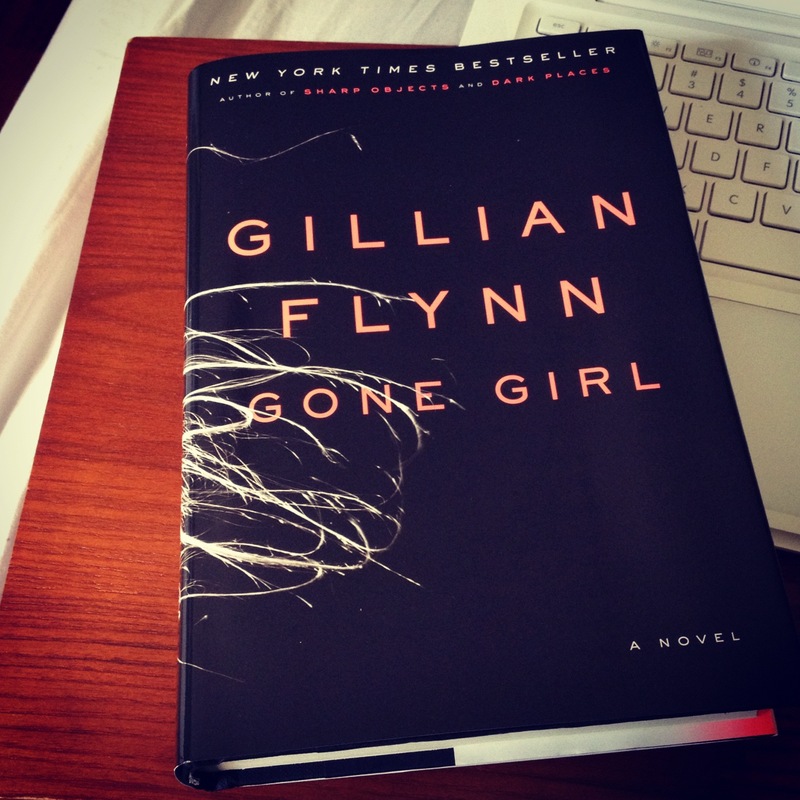 I admit, this post is a premature one considering I have not finished reading this novel yet. However, in that being said, I am already struck with the idea that suspicion surrounds Nick because of his persona and actions during his wife’s (Amy’s) disappearance. Granted the police have to start somewhere and of course, it is those closer to the victim who are always suspected first. But, the concept just got me thinking of how people are perceived and how important those perceptions really are in certain situations. Not going to lie, that killer smile makes him seem pretty guilty right? So what does this all have to do with the title, “The Norm”? Well think about it, if we don’t act/react the way society dictates us to, we’re perceived as weird and depending on the situation, guilty. See, the thing with Nick is that he was taught to hide emotion, to hide it from his father and the world because quite frankly, emotion was a sign of weakness. So maybe his way of dealing with it is to not show his inner turmoil. So is it fair to deem people as scrupulous in nature if they do not meet our reaction standards? I mean you have to admit, categorizing people based on their reactions/actions is a well-oiled survival mechanism allowing us to instantly distance ourselves from a potentially shaky individual. But again I say, is it fair? As I said before, I haven’t finished the book yet, so the question of whether Nick is guilty or not still hovers over me. However, I have a sneaky suspicion that no matter how guilty he appears to be, a Red Herring will be thrown in and give an unexpected twist. I’ll just have to find out for myself now won’t I. A place where if a snake was backed into, would instantly strike viciously at its attacker(s). It is a well coined expression based on this absolute truth of what actually happens. So this begs the question, do we humans always strike back without a second thought if faced with a similar predicament to that of the snake? I believe it is instinctual, ingrained in our basic need to survive. But, can we ever overcome that instinct with out intellect and squash that behaviour if we feel it to be self destructive? Sounds like an intellect vs. instinct topic doesn’t it. So I will leave with this: What will happen if one is backed into a corner? An even scarier notion, what if that person had nothing to lose? We all have one don’t we, that metaphorical hole which we fill with something or another to make us feel whole. Its substance unique to the individual as, of course, everyone has different priorities. The putty, if you will, could be anything from socializing and shmoozing, shopping, family, religion, health and fitness, etc. So where exactly am I going with this seeing that the above paragraph is ridiculously obvious? Well, what happens when it’s barren? When life is void of meaning? It’s dismal to think about the idea if yours is filled to the brim with nothing but positive things, but for some people this is their reality. So is this when people turn to scrupulous activities and become self-destructive? I mean, it’s undeniable that many negative outcomes to such a bleak outlook on life exist. For instance, a prime example would be the unfortunate and deadly, last-ditch-attempt-to-make-the-world-a-better-place suicide. So this begs the question, shouldn’t there be more effective safety nets installed in any given society that helps these said people? There are so many factors which can deprive someone of a full void like, for example, losing their job. So does that mean that we, as a collective, are responsible for these people? That the government should be more active in helping those who risk severe depression? Now don’t get me wrong, I’m sure that our society has installed a plethora of groups specific to treating those that fall into self destructive habits. But, are they as effective as we think? With all these questions swirling about, it would have been nice if I were qualified to research further into this… maybe a major in sociology wouldn’t have been such a bad idea. Right now I’m watching a news broadcast on the jaw dropping (and not in a good way) results of Michael Phelps’ 400 IM event in the London 2012 Olympics; the same prodigy athlete who dominated swimming in the 2008 Olympics. Now when I say dominated, I mean won by a ridiculous amount of time, every single time. It really was a genuine treat to witness such mind-numbing, perpetually achieved victories. But oh how the tides have turned. According to the article “London 2012: Michael Phelps admits he swam a ‘crappy race’ vs. Ryan Lochte” in the National Post, Lochte beat Phelps by 4 seconds in the 400 IM event. Yikes! To me, this sounds all too familiar as I did write about a similar subject in a previous post of mine called The Plight that is Teaching. Needless to say, I could not stop grinning as I witnessed this theme weaving its way through this broadcast and how it was taken one step further. In my post, I had talked about how we tend to do this to our teachers, but of course this can be applied to our idols whether they are celebrities or teachers. To be honest, I think we need to keep things in perspective and not put our idols through ridiculous standards. Once we realize that they are indeed human beings as well, we don’t risk suffering needless, severe blow to our psyche. A beautiful and idealistic notion isn’t it, to include everyone regardless of their differences. To have that one sanctuary void of judgement, a place to find internal peace and a strong sense of community. This increasingly strong Moksha subculture has taken root in the Western world despite being around for centuries. Why? Because of this promise of inclusivity. The Western world is a conglomerate, a heterogenous mix of differences all bombarding each other. There are different institutions and facilities based on strong diasporas, but has anyone thought of an attainable union? Now, that goes without saying that there are institutions in the public sphere aimed at embracing differences, but I have never come across a pure place of union – of different people with different religions, political views, etc – like a Moksha studio. Granted, I’ve never tried to search for places like this. I just only happened to stumble on Moksha because I wanted to try hot yoga. But, needless to say, places with this ideology are much needed, especially in an increasingly hostile environment towards differences. Intoxicating in the promise of sheer bliss, this – dare I say – social movement is taking the Western world by storm. With all the scrupulous activities, global conflicts, and hectic lifestyles, environments like that of a Moksha studio is seemingly the white knight we all need, the white knight that is accessible to all who seek out the peace and belonging they desire. 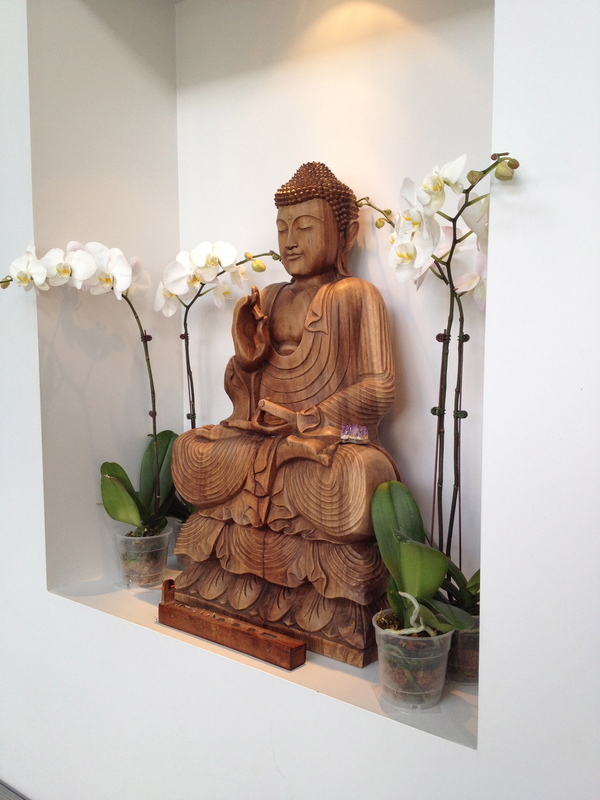 ©Farrah Merza: The Buddha statue that, upon entering the Moksha studio, you first see. Peaceful isn’t it. Where do I even begin? What did I even mean “to exist”? Maybe the brief context behind this revelation is due. I said this to a man who was having a conversation with someone else while a speaker was talking to the crowd. I was arguing with him about why he should be quiet. Then, he argued that we all have the right to exist, which brought me to retort with this quote. He smirked and fell silent. Maybe I meant to exist in a space surrounded by others. If so, should we be in that space if we are “crab-bucketing” those said people? Hindering them, mentally or physically? Or was I indirectly speaking about the collective and our right to exist on our humble host, the earth? We are indeed choking it, destroying parts of it like a virus. Sorry to splash you with the cold hard reality, but we are the most resourceful virus without the proper immune system to destroy us. That has been my mindset as of late, reflecting on the proper metaphor to describe humanity’s destructive nature. The vagueness of this dream is stifling, however this quote leaves a gigantic abyss where you can fill with your own thoughts. To exist or not to exist while being a hindrance? That is the question. As I was reminded by a fellow blogger stfallen (check out his blog! ), our stereotypes, labels, and stigmas we have of others are more deeply rooted in our perception, not just in instinct. This is why propaganda works so well as it aims at our perceptions of the world around us. Political, religious, and other social propaganda endanger us all, turning best friends into mortal enemies and peaceful nations into waring ones… aka the force which is powerful enough to derail us from the progress we are making. Don’t doubt me on this, because it’s true. Just think back in history and of the intensity of the marginalization of people. Now, compare that to today’s society. See, progress, especially in more metropolitan areas due to the influx of immigrants. Now I know that most Canadians take pride in our Multiculturalism thanks to our charismatic leader (in the past), Pierre Trudeau. We have assimilated it into the Canadian identity, aka what it means to be Canadian. This mentality makes it easier for most of us to tolerate those who are different. Unfortunately, this is not the case with other countries. So it is my hope that eventually, this concept of coexistence will reach those countries and progress takes root in their fertile soil. Stigmas, Stereotypes, & Labeling… Oh My! It was about time I touched on this subject. I really have the numerous sociology courses I took during my undergrad to thank for this as this subject was constantly brought up. You have to admit that they play a vital role in today’s society. But, let me explain: As I wrote about in a previous post of mine called Inescapable Judgement, I briefly mentioned that judgement could very well be a survival mechanism deeply rooted in our primal instinct to avoid danger. It’s necessary, but highly problematic. As a result of this desire to be safe, it is often the case that certain groups are marginalized and pushed aside because we deem them unsafe. Unfortunately, their potential to grow and change is squashed like a bug. What’s worse is that fighting these stereotypes, labels, and the stigmas associated with them can prove to be difficult; almost like fighting quicksand. Unless you get someone to throw you a rope and pull you out, the earth will swallow you whole. Dismal, noh? But here’s the thing, breaking down stigmas, stereotypes, and labels won’t happen overnight. It just can’t because, like I said before, it is instinctually ingrained in us to group similar people together and label them. We want to be safe, period. It’s only inevitable that stigmas set in. However, I truly believe that we are heading in the right direction IF nurtured properly… I just hope we don’t get derailed any time soon.